Being Frugal and Making It Work: Check out the Holiday Gift Guide: Win Your Christmas Gifts! 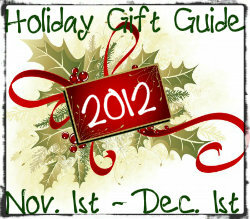 Check out the Holiday Gift Guide: Win Your Christmas Gifts! I'm trying to help make your holiday shopping a little less stressful, by providing fun gift ideas for the entire family and giving you the opportunity to win them! The Holiday Gift Guide is in full swing here at Being Frugal and Making it Work! Have you checked it out and entered any of the giveaways? I enter blog giveaways on a daily basis in hopes of winning some great holiday gifts! Not only does it allow me to stretch my budget, it also allows me to give some pretty amazing gifts that I wouldn't be able to otherwise! My latest win was Arnie the Interactive Dinosaur over at Frugality is Free, who is also currently running an amazing Holiday Gift Guide! What is your favorite item in my Holiday Gift Guide? My favorites are the Boba Mini Doll Carrier & the melissa & doug toys :) Those are great companies/products to give away during hte holiday season :) Thanks for the great list! you have a great List! lot of idea's for gift giving. I love so many items you have in here...woohoo!